The business district of the city is a buzz for over a week now with people shopping for clothes, groceries, decorative lamps, gifts and of course clothes. 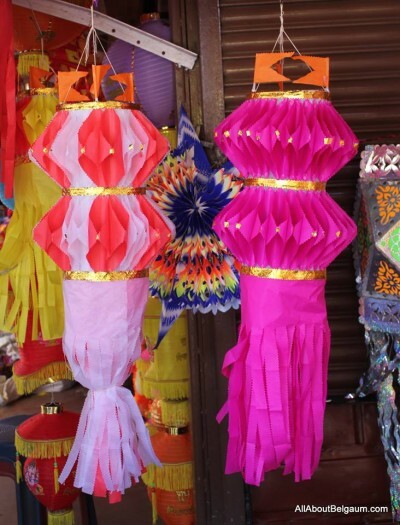 Diwali Lanterns of different sizes and shapes are in the market and most of them are Chinese. We also found the traditional octagonal and star shaped ones made in Burud Galli and ones made with paper. Kids are spending their time making the replicas of the forts. The buzz of making fort replicas which was earlier seen in Angol, Shahpur, Vadagon is now visible even in other areas. We would suggest not to use those Loud sound making crackers and if possible have a pollution free Diwali. My humble request, please do not wish us happy bankruptcy (diwaLi). Instead deepavaLi conveys the correct message.